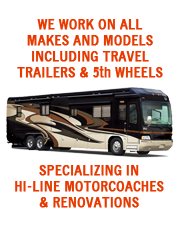 Apache RV Customs is a specialist in RV flooring installations of all types and designs. Whether you're looking to warm your RV up with radiant heated tile flooring or want a custom patterned floor design installed that will WOW your neighbors, Apache RV Customs has the knowledge and experience to get it done. Apache RV Customs knows that your RV is your home and believes it should be just as comfortable. Apache RV Customs designs practical interior solutions based on your wants and desires. From custom RV furniture to expanded storage and tricked out lighting Apache RV Customs treats every project with a personal touch. Bring all the comforts of home on the road with you with some simple yet modern upgrades to your RV. Convert your small RV refrigerator into a spacious residential refrigerator, upgrade that old tube TV to a 42" HD flatscreen, remove the pull curtain blinds in the cockpit and replace them with a powered windshield shade or even go full electric and eliminate LP from your RV altogether.